The Capricorn and Libra love compatibility can be happy. They might find it hard to find each other’s traits that are similar to their own. They will be very different from each other on the surface. The Capricorn zodiac sign will be innocent and quiet. They will be concerned with working hard for recognition and to advance their career. The Libra star sign will be more social. They will love visiting other people. At the same time, they will be concerned with beauty and art. They will want balance in their life and their relationships. However, this does not mean they do not have anything in common. If they both love each other and have a lot of respect for each other, the Capricorn Libra soul mates will be able to find what they have in common. The planet Saturn that rules over Capricorn is all about karma. This planet has a cold, hard, male energy. The love planet Venus will rule over Libra. This planet has a soft, receptive, female energy. The planets do not have much in common. It will be important for the Capricorn and Libra in love to work on their differences. Venus will encourage the Libra personality to slow down and take in the beauty and romance that life can provide. Because of this, the goat might see the Libran as being lazy. Saturn’s influence will give the goat their stubborn determination to push forward. They will work against the odds and accomplish the goals they have set. Saturn and Venus can work against each other. They could make antagonism and be unhappy. They might both hide their emotions. They will both need to make a good effort to understand and accept each other’s views in life. Capricorn will have to be careful not to discourage the Libran from being naturally excited and positive. Libra is naturally gracious and they will have to use this to help keep the relationship with the goat balanced. Capricorn is an Earth sign. They will depend on their brain, but in a different way. They will look for the rational method in everything that they do. They might not feel like they have time to waste on aesthetics. Libra is an Air sign. They will depend on their intellect. They are sensitive to aesthetics. They will always have a lot of opinions on aesthetics. Capricorn and Libra relationship can work together well as a team. They can easily be two halves of a relationship whole. Capricorn and Libra zodiac signs are both Cardinal signs. They will both easily start new things. However, they have varied work ethics. They will work better when they both have very well defined roles. If in a Capricorn and Libra friendship, both have a fight, Libra will be the one to usually back down first. Capricorn will be happy. They will like to believe they are right. They will both need to understand that they will have to compromise to have a successful Capricorn Libra compatibility. The best thing Capricorn and Libra compatibility will have in a romantic relationship is that they will both bring their own original qualities to the relationship. They will both need to understand that they are different and not try to change each other. If they can do this, they can mix well to make a whole. They will have a challenging relationship. However, they will be able to learn a lot from each other if they want to. The Libra man or Libra woman ruled by Venus is witty, charismatic, and has a lot of social grace. They will be attracted by the goat. Capricorn will prefer to think they are not attracted to trivial traits. However, they are attracted to the scales zodiac sign. They are impressed with how the idealist has a laid back nature. They have a lot of wisdom and a hard working nature. When the Capricorn is dating the Libra, they will be happy to court the goat to find their love. Capricorn and Libra marriage will not seem compatible on the surface. However, when they are attracted to each other, they can definitely form a bond. 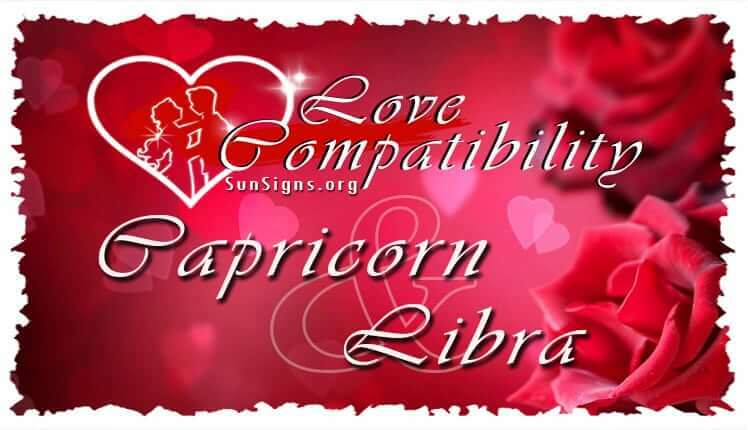 In this Capricorn Libra love compatibility, both will both like to be in control. Because of this, they will work well together on a project or problem with well defined roles. They will both need to define their expectations. However, their approaches will be very different. Libra is very intellectual. They will want to consider the different sides of a problem. At the same time, the Capricorn male or Capricorn female will be able to see the rewards of doing something the hard way if it will definitely be a success. They will both need to try to understand each other’s view. They will both have strategies that will help them to accomplish more together than they can on their own. Capricorn and Libra in love will both be looking for influence. The goat will want to climb the ladder in their career until they get to the very top. Libra will be very ambitious, but they will be better at hiding it. They will be ambitious because their success will give them material rewards. Capricorn can be somewhat ruthless. However, when used with Libra’s social grace, they will make a team that can accomplish almost anything. This couple will likely both be more motivated by the rewards of climbing the social ladder or material possessions than passion. Capricorn and Libra will be compatible in love because they are an earth sign and air sign. Their relationship will be rational and intellect mixed together. However, the Capricorn Libra relationship might not have a lot of enthusiasm. Capricorn is the sage of the zodiac. Libra is the idealist of the zodiac. The sage is wise and mature. The idealist is a romantic. Capricorn and Libra compatibility might be a fight between the proven methods of Capricorn and the looking for a better way to do something that Libra prefers. They will both have strong and different opinions. Capricorn and Libra zodiac signs will have a challenging romance. The goat has an earthy seduction. The scales has a kind of romantic finesse. The Capricorn Libra in bed can have a physical relationship that is satisfying for both of them. They can both be somewhat emotionally distant. They might find it hard to communicate what they are feeling but will not understand each other’s sexual needs. Capricorn and Libra might have a challenging relationship in their everyday life. They will likely fight over money. Libra likes to spend money and Capricorn will prefer to save money. They could fight over a social life. Libra men can be flirtatious and will prefer to be around a lot of people. Capricorn women would rather be alone or spend time with just their partner. They could fight over their family life. They both have very different ways of parenting. Libra women is a laid back and cheerful parent. At the same time, Capricorn men will be responsible, have a sense of duty, and will be somewhat strict. They will definitely be able to compromise with each other. At the same time, they might have a lot that they need to compromise on. Libra born will naturally want to look for perfection. They will not have the same wisdom and will be looking for something new. Capricorn will naturally want to build on what is already there. They will have a lot of wisdom and maturity. Their ruling planets will work against each other. Venus will be restricted and held back by Saturn’s authoritative nature. They are very different. Because of this, it might be hard for them to find zodiac compatibility. When they do find it, they might find it hard to keep it thus ending in a Capricorn Libra breakup. If Capricorn and Libra are in love, they will be pushed to compromise. Because of this, they can work together and be good for each other. Libra will bring light to Capricorn’s serious life. Capricorn will help make Libra’s idea stable and rational. They will find it hard to handle fights. Capricorn will not want to negotiate. Libra is gracious and will try to negotiate a solution to everything. If they love each other, they will be able to overcome almost anything in this Capricorn Libra compatibility.